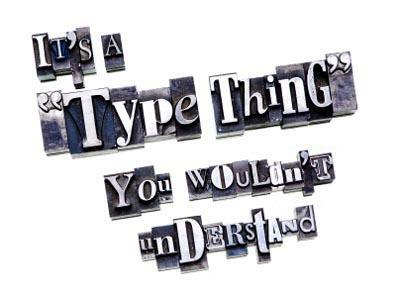 Why is typography important? For avid crafters, understanding the basic components of good typography makes it possible to use text as a design element in their scrapbook pages, handmade greeting cards, calligraphy, or rubber stamping projects. Typography simply refers to the art of arranging type in an effective manner. Obviously, the most important answer to the question, "Why is Topgraphy important?" is that the viewer needs to be able to understand what message you're trying to send. If your text is too small to read or all cramped together, your project won't get a second glance.Beyond legibility, however, typography is important because it can be used to convey a specific mood or feeling. Gothic fonts or typefaces that look as though blood is dripping from the letters can be used for a Halloween party invitation. A scrapbook page could incorporate handwriting fonts that are set at a slight angle to mimic the casual look of a child's handwriting. When designing a piece of artwork that uses calligraphy, you may want to make particular letters or words larger than others to draw attention to the most important part of the quote. The four key elements of good typography are repetition, contrast, proximity, and alignment. Repetition is consistency taken to the next level. In any typographical work, elements such as bullets, lines, colors, and typefaces should be consistent throughout. However, experienced designers know it's helpful to highlight one of these elements. You can make an element stronger by repeating it as a key feature in your design. For example, when making a scrapbook page, you might repeat the same triangle shape from a bulleted journaling list by using it as an element within the captions on your photos. Contrast refers to techniques that are used to draw attention to certain elements on a page. This may include the contrast of black text on a white background versus white text on a black background. Other examples of type contrast may include varying the size, weight, structure, form, direction, or color of the fonts you choose for a particular piece. When choosing contrasting elements, however, it's important to make it obvious that the two elements aren't the same. You don't want your design to look as though you weren't aware that you'd made one line heavier than the other or that you'd accidentally used two slightly different versions of the same typeface. Proximity refers to grouping related elements together. This might include a heading and a subheading, or an author name and a date. Elements that are related should be grouped closely together, while elements that aren't related should be separated to ensure the viewer understands the two elements aren't connected. Alignment helps keep the look of a piece unified. A flush left or flush right alignment gives the piece a stronger edge line for the viewer's eye to follow. It also tends to give a more sophisticated look than a centered alignment, which is often the choice of typography novices. If you honestly prefer the centered alignment, try placing the centered block of text on one side of the page and use a line or other graphical element on the opposite side to make your design more interesting.